Looking to buy Complete SEO Software for your online business? SEOprofiler will be your suitable software which provides complete seo tools at an affordable price to optimize and rank any websites with some efforts. To know everything about SEOprofiler this SEOprofiler Review will be your best answer. This review about SEOprofiler is written after using it personally for months. While searching to find the complete seo software for my business I landed in SEOprofiler.com through google search results. To support my online business, it is necessary to own a seo tool for ranking my website through optimization. After discussing with their team and asking various queries, I finally purchased it to give a try and to review whether it is the best SEO tool or not. But surprisingly after using this SEO tool, i see positive results, and I have learned to do SEO for all of my websites. So after getting huge success by SEOprofiler finally written this review. In this SEOprofiler review, I am going to check this seo tool by using its significant features like website auditing, keyword research, Backlinks finder and link building. And also this SEOprofiler review will teach some methods to rank your website. SEOprofiler is web-based seo tool helps many internet marketers to get high rankings since 1997, and It is the main seo tool from Axandra GmbH Company. The powerful seo tool which helps to rank your website on various search engines to bring more traffic to your websites. One of the main reason to use SEOprofiler is this tool follows only the white-hat SEO method and automatically updates according to google search engine algorithm and saves without getting penalized by google and other search engines. And another cool thing about SEOprofiler offers essential seo tools to outrank your competitors. Let discuss the features of this software one by one in SEOprofiler review, because it got more than 10 awesome features and every features gives you a detailed report with different colors which makes easy for you to optimize your blogs. Website Audit – Analysis your website to optimize it to get high rankings. Link Profiler – Useful for finding website Backlinks. Link Building – Gives you the best backlinks opportunity to outrank your competitors. Ranking Profiler – Get your competitors ranking keywords. Adwords Profiler – Get your competitor adwords campaign details. Page Optimization – Optimize your pages for higher rankings. Keywords – Keyword Research is useful for finding low competition keywords to rank easily. Uptime Monitor – Notifies when your website goes down. Website Analysis – Analysis your entire website and gives every piece of information. Social Media – This tool allows you to monitor who are talking about your company or your products on social networks. Client Reports – Create a detailed version of your work and send to your customers. For this SEO profiler review, I have picked only the important features to test. Why should I check only a few tools rather than testing all from it? Because the features which I am going to test is the most valuable tool for all bloggers and internet marketers to bring their website at the top of the search engines. Website auditing is the first part of every website to find errors to remove it. Let me ask you one thing. How would you achieve better rankings If your website is not at all better? If your website has got internal errors how it will rank in search engines? Website errors will discourage search engines to neglect your websites. Audit your entire website by this awesome tool and remove the errors and make your website for better user experience and achieve high sales. In this SEOprofiler review I am auditing one of my blogs to find any errors to solve and fully optimize it. See how many errors it found and now I will simply solve errors and make my website fully optimized. This tool will audit your web pages once a week and send audit report to your email address automatically. The most important part of writing content is keyword selection because it’s the factor which decides your success. Keywords only will bring traffic and sales to your website. So now how are you going to find the best keyword to write contents? Let’s learn to find the best keywords in this SEOprofiler reviews below. Should be easy to rank. Search volume should be more than 1000. Well, SEOprofiler will give you the right keywords to you. For this SEO profiler review, I choose “software” as the main keyword to find how many people are looking for that keyword. The keyword research tool found more than 1000 results with search volume, Estimated bid for adwords campaign and competition level. This keyword tool also generates long-tail keywords, and these keywords always have low competition so you can easily rank for any keywords by working smart using long-tail keywords inside your content. 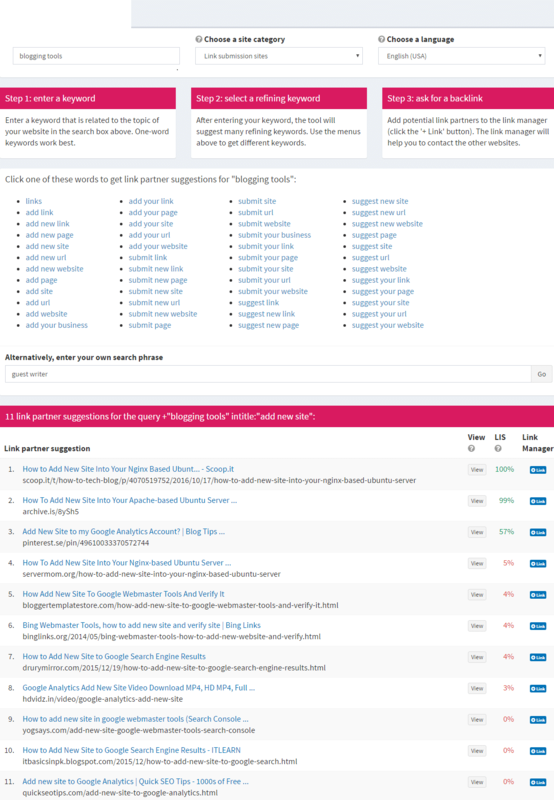 See how this SEOprofiler is guiding me to choose the right keyword to bring my page on top search engine results. Another nice feature on this best SEO tool is that you can see how many people are searching for that by choosing county wise. One of the best parts of SEOoprofiler is keyword difficulty tool which checks the keyword and warns whether should I go for that keyword or not. 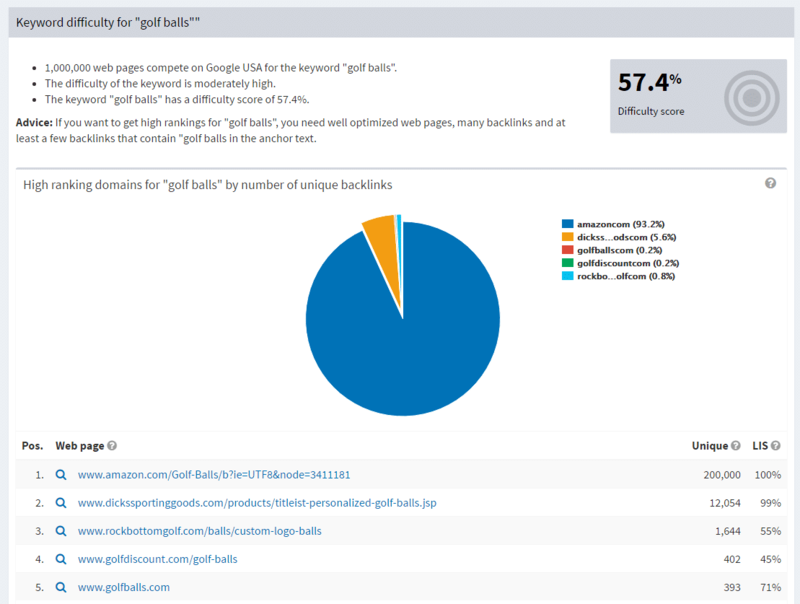 Keyword difficulty for golf balls is 57.4% which is moderately high, so it is hard to rank for the keyword. To rank this keyword, I need more backlinks from high authority pages, so it is better to leave this keyword and find any related keywords which have low difficulty score. By using this unique tool, I will pick the keyword which isn’t difficult to rank. Backlinks are the main factor for off-page seo to replace your competitor’s position you need to build more backlinks than your competitor. This tool is the best seo backlink software generates the total number of domains pointing to competitor’s domain. Shows bad backlinks which affect your website rankings. Top ranking domains are pointing to your website. Shows both dofollow and nofollow links. Find backlinks by choosing the category. Find link by anchor text. The link Profiler tool generated backlinks of moz.com and by using the filter option i will choose the links relevant to my niche to create backlinks. So now my next step is to create backlinks on those websites, and as a result, my website ranking will increase by this best seo backlink finder tool. High-quality backlinks will boost your website ranking and according to google algorithm website having high relevant, and authority backlinks rank faster. Many automated tools will create backlinks faster but it will create spam, and google will penalize irrelevant backlinks that will hurt your domain ranking of your website and finally google will remove your website from search results. For link building purpose I use SEOprofiler to build backlinks to my website yet the process is manual and time taking, but without any concern, I can use this tool for building backlinks. This tool follows google search engine optimization guidelines, so I don’t have to worry about creating backlinks. The best part which enticed me to buy this tool is Keeps tracks all my links and show malicious links. Link Opportunity Finder: By entering keyword shows relevant sites such directories, forums, blogs to create backlinks. Starter Backlinks: Gives authority sites to create backlinks. Local Hubs: Submit your website to all relevant local sites to cover local audiences. To test this best seo backlink creator, I typed “blogging tools” and selected link submission sites as the path to creating backlinks. It gave me 11 relevant sites to build backlinks. By using SEOprofiler, you can easily create backlinks for any keyword and SEOprofiler will guide to create backlinks quickly. Starter Backlinks is another link building tool which provided more than 800+ authority websites to submit our websites. Every link has minimum 50+ DA and 40+ PA, so it has the potential of bringing any website to the first page of google. In the above SEOprofiler review, we saw about keyword researching, backlink finding, link building to bring our website on top 10 results. 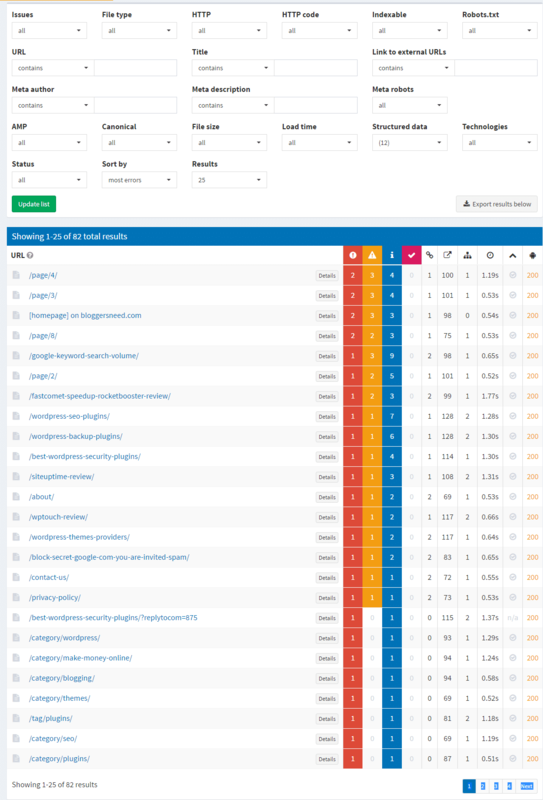 To check our websites ranking, ranking monitor tool will show the complete record of our ranking keywords in search engine. For which keyword our website is ranking. It shows the search volume for the keyword. In which countries the keywords are ranking. Tracking of our keyword position daily. How keyword ranks in mobile devices. The ranking monitor will monitor the ranked keywords daily, and if any of the keyword rankings drops down, it will alert you instantly. If you own seo agency, you can impress your clients by sending detailed keyword reports regularly. Social media marketing is the next level of internet marketing; It is the place where people will always be engaged with some activities. 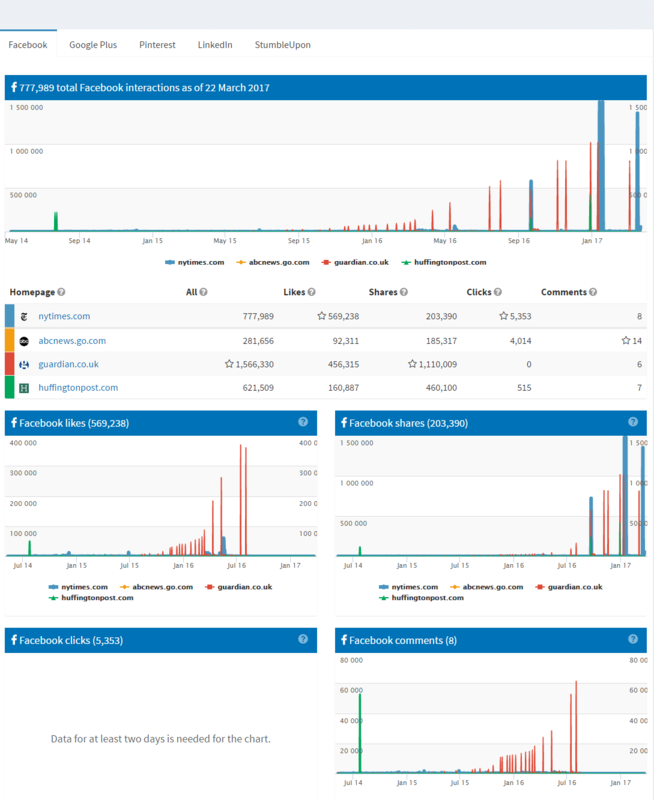 This tool can track all the conversation going about your company or product on social networks. By joining with them, you can ask various questions about your product, and you can improve your product by any suggestions and by the way your product sales will increase. Everyone would probably know about uptime monitoring and why it is important to have it. When a customer visits your website, and the website is down at that time, then you would literally lose some sales. So it is always advisable to have website monitoring services to watch your website 24/7. 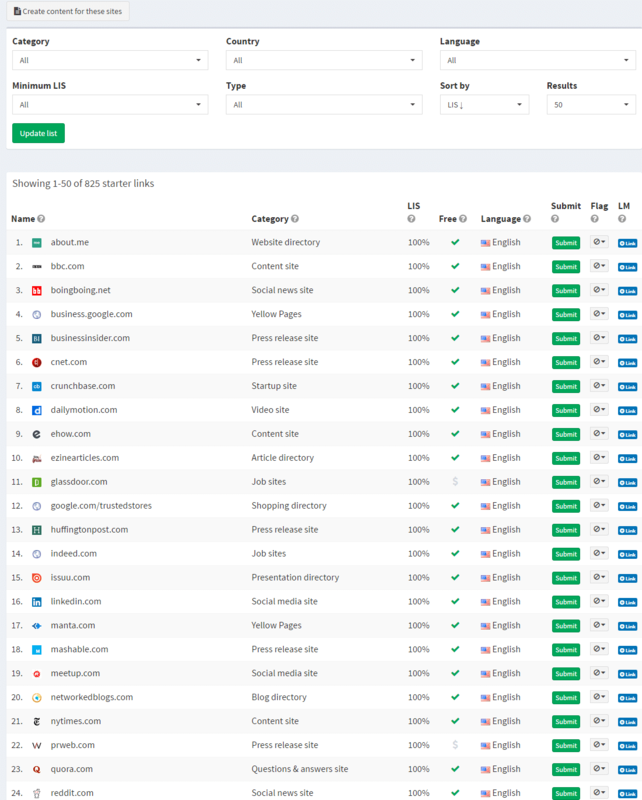 I don’t know whether any other seo tools have this kind of feature but SEOprofiler the complete seo tool got this awesome tool to monitor your site and alerts you through email when your website goes down. Other than SEOprofiler if you are looking for uptime monitoring services go for uptimerobot or siteuptime because these two tools are great to use and appreciated by many internet marketers. Let’s discuss about SEOprofiler vs Seomoz in this SEOprofiler review, i see a lot of discussion in many popular forums, and they are frequently asking which would be the better tool to use. To be frank, If you ask me which should I go for? To me, these two are great seo tools for optimizing your websites. But to me, my choice is SEOprofiler without any doubt. In SEOprofiler you have every seo tools present, but in Moz, you would miss some features. 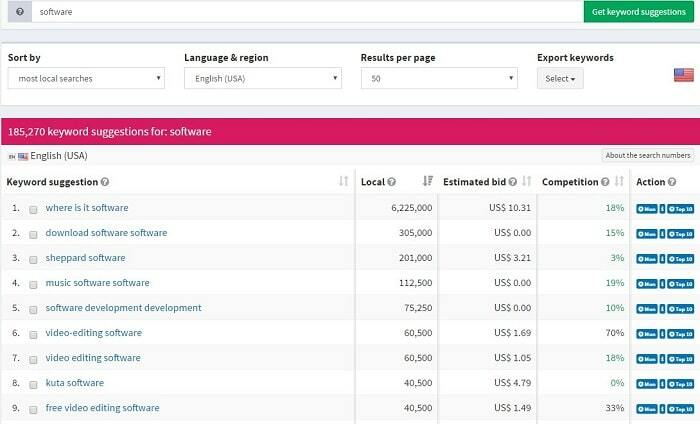 SEOprofiler = Cost less and contains all seo features. Seomoz = Cost high and great features. SEOprofiler typically has four different plans, and each plan comes with various advantages and buy this complete seo package on your choice. 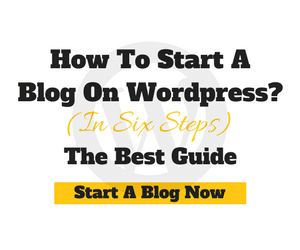 Standard Plan: Good for optimizing small blogs with 1 User account. Smart Plan: For medium level blogs and with 5 user accounts. Professional Plan: For professional websites with 15 user accounts. Enterprise Plan: Best plan for seo agencies with unlimited user accounts. 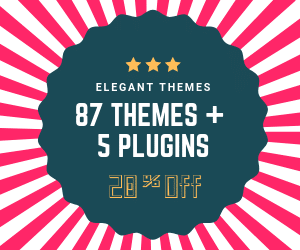 This Offer is only for Bloggersneed Readers for reading this SEOprofiler review, and You are one of them so enjoy the offer. SEOprofiler Coupon is already embedded inside the link. To activate click GO TO THE DEAL Button and choose any plan and 33% discount will be applied. Pay with your Paypal or Credit Card. If you buy any of this plan by pre-paying for one year you will get 33% discount, and there is no risk involved because of 30 days money back guarantee at any time. SEO is the best way to gain traffic to your websites and especially for affiliate marketing business to get more customers and sales. To do complete SEO for your website you need best seo tool like SEOprofiler and anyone can write outstanding content and build beautiful websites but bringing your website on top of the search engines could be done only by search engine optimization. By using SEOprofiler, you can easily optimize your website and bring your website on top searches with some efforts. 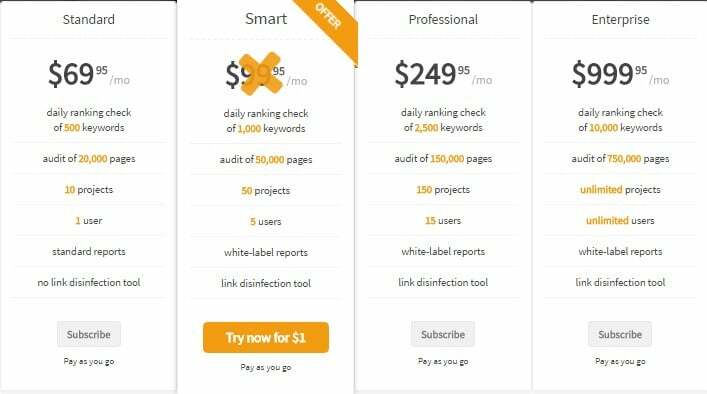 Now it is up to you to buy this complete seo software or not, and I hope you finally had every piece of information about SEOprofiler in this reviews. 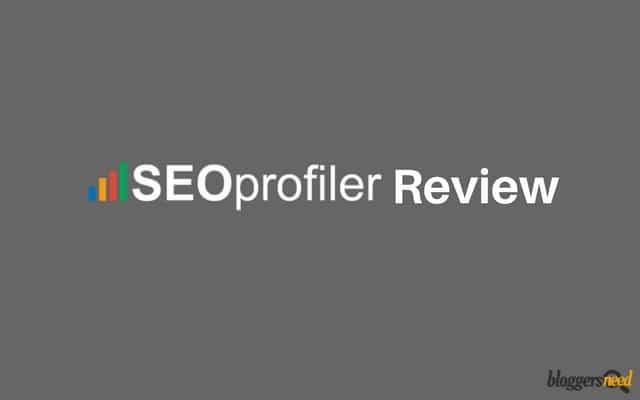 Also, I taught you how to find keywords through keywords research, search for and build backlinks to your site in this SEOprofiler Reviews, and I hope so you got some ideas about using SEOprofiler to outrank your competitors. If you are looking to buy all seo tools in one place then without any doubt Buy SEOprofiler because personally, I know even top seo tools doesn’t have complete seo package like SEOprofiler. These days if you’re going to succeed at search engine optimization you’re going to need tools. Keyword research can be a complicated process these days, requiring us to consider the context of our website and a range of competitor metrics such as backlinks, domain authority and page authority. 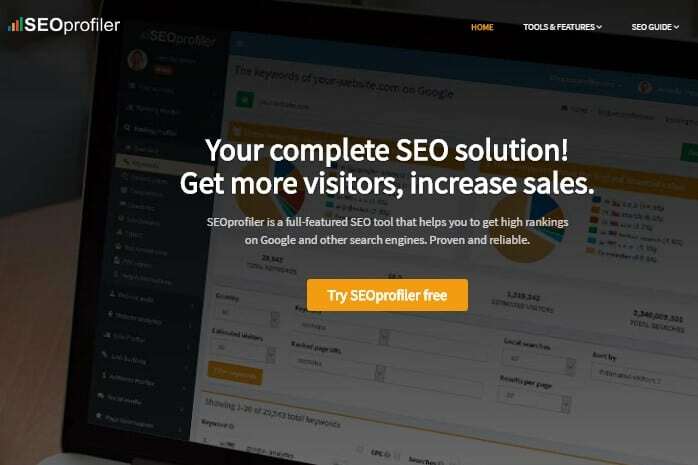 SEOprofiler offers several tools in its software suite to help you improve your search engine optimization (SEO) efforts, which, in turn, improves your site traffic and sales. Eventually, thanks for exploring this tool in deep.